My pancake-making adventures definitely fall in the no-recipe realm. I started out working from recipes, sure, but at some decided it was more fun to just throw some ingredients together and watch them work their magic. Generally you can test a few and then adjust as needed (unlike with real cakes). Apart from that one time that I added way to much baking soda, it seems to work pretty well. I really like buckwheat. It’s not actually wheat at all, and is therefore gluten-free for those with sensitivities. In addition to being delicious, it has many health benefits. And, it has a short growing period and grows happily in poor soils. It’s often used as a cover crop, which means replacing nutrients in the soil (although if you are plowing it under as a green manure (green as opposed to brown, i.e. animal manures) instead of harvesting it you don’t get to eat it. Still, I’m pretty sure buckwheat production is better for the environment than other grains/seeds that are used similarly). Buckwheat flowers are great for pollinators, too. You can add it to all sorts of things. This time it was normal American pancakes, but you can also make galettes/crepes, soba noodles, even chocolate chip cookies (which I did make, by the way, and they were delicious. A little puffier than my usual cookie, but I’m a fan). Make sure to pour on the maple syrup (the real stuff, obvs. The rest doesn’t bear mentioning. In college I would ask for molasses to put on pancakes rather than use the fake stuff, although we occasionally had real maple syrup (!)*). It may help make antibiotics more effective—although the article that mentions that suggests manufacturing some sort of extract, which I think is silly—why take medicine when you can literally eat a spoonful of sugar to accomplish the same thing? Also, I’m partial to small pancakes. When I lived in New Zealand we called them pikelets. If you want to make large ridiculous pancakes, do what you need to do (but these cook better). As you get familiar with the amounts, you’ll be able to throw them together without measuring like I do. I usually mix it all in a measuring cup anyway, melting the butter first and then adding other ingredients as I go, which helps with guestimation. 3/4 cup flour: buckwheat, whole wheat, white, or a combination—whatever pleases you! Extras: pecans, slivered almonds, chocolate chips, cacao nibs, fruit, coconut! Melt the butter in the bowl/large measuring cup first. Let cool for a bit, then add in yogurt/milk, stirring quickly so it doesn’t all seize/solidify, and your egg (you can add the egg right to the butter too but just make sure it’s not hot enough to cook the egg at all!). Mix in vanilla and other extracts, if you like (boozy pancakes, anyone?). Put in the oatmeal, if using, stir, and let sit for a little while to soften (you can also cook the oatmeal beforehand if you don’t want as much texture; not necessary if you’re in a hurry). Add in the flour, cornmeal if using, put the baking soda/powder and salt on top and mix it into the flour a little, then stir it all together. Add in any extras that you want, and mix until the flour is just barely wet (lumps are okay). It should be fairly liquidy and spongy; add more milk/yogurt/water as needed to get the right consistency. Heat up a pan with butter (or oil) until quite hot over medium-high heat (I think our electric griddle at home was at 400 for pancakes, the highest setting). With a ladle, or small measuring cup (1/3 cup is a good size), measure out some batter and drop into the hot pan. Cook until bubbles appear on the surface, then flip. Adjust temperature as needed. 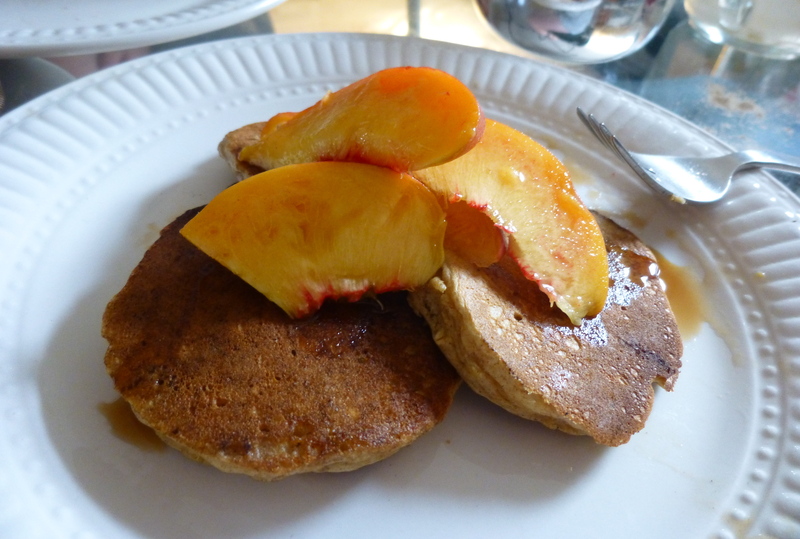 Flip onto a plate, cover with fruit and syrup and butter and enjoy! 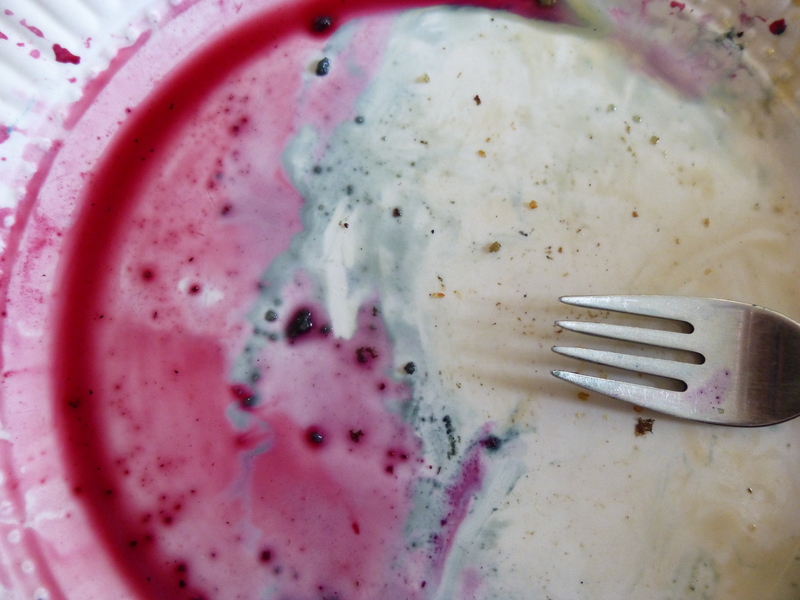 This I took out of fascination of the changing colors of blueberry juice… Something to do with PH? *Side note. This (!) is my new favorite punctuation mark. A subtle often ironic emphasis. I can’t figure out what it’s called though, shouldn’t it have a cool name like interrobang?! Who says you can’t eat local in Maine all year round? I was worried about getting enough fruit in the winter, but so far I am doing quite well. This is because a) freezers b) apples store ridiculously well (side note: I kept apples in my fridge in college for months and months after going apple picking, and used them up very gradually (not having time to bake), but they were still good, albeit a little wrinkly, after having survived the winter and numerous attempts by my dear roommates to throw them away. Wrinkly ones do requires some peeling and attention, but otherwise they remain delicious) and c) local fruit just keeps coming! Cranberries and pears are the latest crops, both of which keep well as well, and pears have to ripen for a long time anyway. Breakfasts are where I eat most of my fruit, along with yogurt (remind me to write down my yogurt tasting notes sometime. 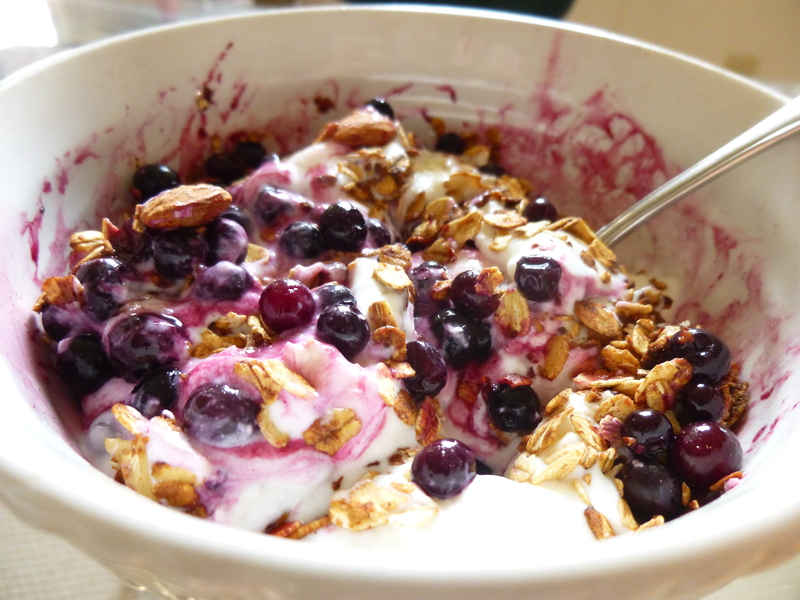 I eat yogurt almost every day and have tried a fair number of them, never get sick of it. Definitely get the whole milk creamy-top version) and sometimes oatmeal, toast, granola, or some other baked good. In the summer I had fresh fruit, melons or berries, and now I usually have either some form of applesauce or I thaw some berries (usually blueberries, but if I want a smoothie I use a mix of blueberries, strawberries, and raspberries). Nom. Anyway the first time I saw cranberries at the co-op I knew I had to get them (and local cranberries, by the way and in case you hadn’t figured this out yet, are much more beautiful and delicious than the packaged grocery-store variety). I intended to make cranberry sauce but have not enjoyed adding a bunch of sugar to dishes lately, and most cranberry sauce recipes contain buckets of sugar. So instead of following a recipe, I threw a bunch of cranberries and apples together in a pot, added a little water (or cider, I don’t remember), and listened to them pop. Ended up with a delicious tart-and-sweet bright pink sauce that gets more vibrant as it sits. Vary the ratio of apples to cranberries per the occasion (Thanksgiving may be a more cranberry-heavy scene), and vary the cooking time depending on how soft and blended you like your apples. Core and slice the apples, peeling only if you want a smooth sauce (I can’t be bothered most of the time, and I like having skins add to the texture anyway). 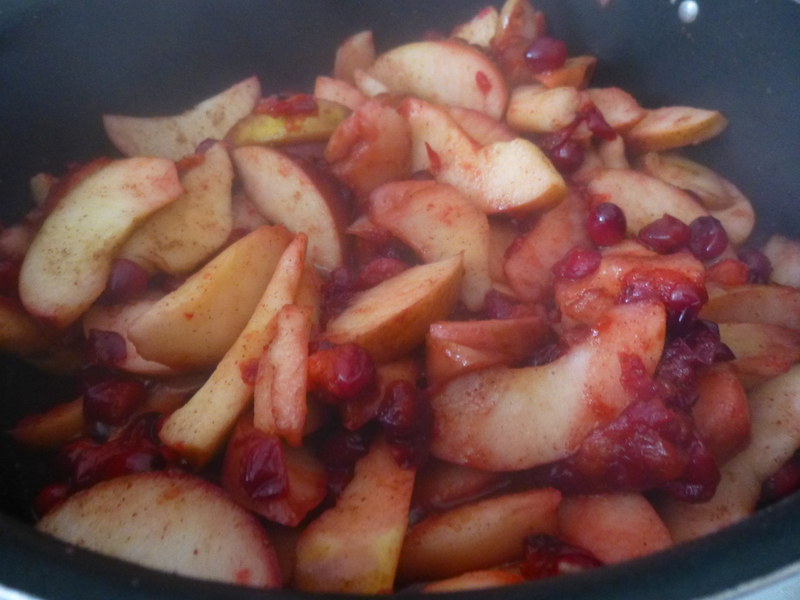 Throw them with the cranberries, spices, and liquid into a pot (larger ones work a little better, but you can do a small one and just start with a smaller amount, adding more apples as you go. This will also create a varied texture, if you like that). Cover and cook on low heat for a good 20 minutes, stirring occasionally to make sure all the elements are getting cooked. Eat at least a few spoonfuls right away (for taste-testing purposes if nothing else), and put the rest in the fridge for breakfasts. As I said, the color will intensify as it sits. 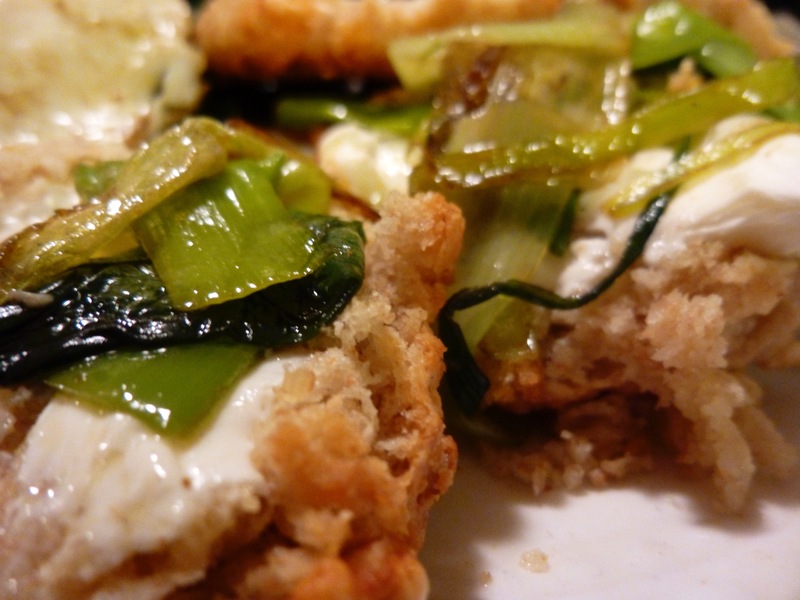 Also happens to be a good thing to have around when you discover a meal that needs just a little extra vibrant tartness. Such as rutabagas and fried beans. I must admit, I’d never done anything with Concord grapes before now. I think maybe they don’t exist in Montana, or at least I never came in contact with them there. Not that they are particularly easy to find in Maine—I didn’t really look for them at the farmer’s market, but I don’t remember seeing them. But someone in the office brought a bunch in, so I took them home, hoping the Internet could help. Turns out the Internet is correct about Concord grapes, and that is that they take FOREVER to seed. Especially in the large quantity that I had. I had been warned and thus was mentally prepared, so I listened to about 5 episodes of Radiolab and called a couple friends and it really wasn’t too bad, but you must also be ready. I found a couple recipes for focaccia, and one for pie (which I made later), and then later made a grape-apple crisp, which I am currently enjoying A LOT. But I decided to start with muffins, based on the recipe from In Jennie’s Kitchen. Her recipe is a bit odd for muffins, honestly—it’s more like a scone recipe, cutting in cold butter, no eggs. I decided to add an egg to keep it moist longer and made a few other substitutions (brown for white sugar, yogurt instead of milk and therefore more soda and less powder, to balance the acidity). And I think they turned out quite well, thank you, not too sweet and with little sour juicy patches where the grapes are hiding. Preheat oven to 400ºF. Butter 12 muffin tins. If you want smaller muffins, you may need a few more—or do what I did, and bake the extra batter in a bowl. Mix together the dry ingredients. Cut in the butter so there are small (pea-sized) pieces. Stir together yogurt, vanilla, and egg, then add to the dry ingredients, mixing just until the flour is moist. Finally, fold in the seeded grapes, including skins. Separate batter into the muffin tins, filling most of the way. Like I said, you may have a little extra; put it in a buttered bowl or small dish and bake it alongside the muffins. Bake for around 20 minutes, until you get a clean toothpick and the tops are golden. Let cool in the pan for a few minutes, then gently slip a knife around the edge of each muffin to loosen it, popping them out of the pans. Enjoy warm, with extra butter if you’d like, and a nice cup of tea.